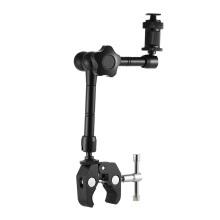 11inch/28cm friction arm and clamp mount for connecting camera and monitor/LED light/flash & etc. The hot shoe mount is removable. 360° rotary swivel knuckle enables you to adjust angle easily. 11inch/28cm friction arm, one end with hot shoe adapter to connect camera, LED light, field monitor & etc; the other end with 1/4" screw. Remove the hot shoe mount, there will be 1/4" screw on both ends. Super flexible 360° swivel knuckle, change angle easily. A bottom clamp mount for mounting on rods, maximum opening 5.4cm/2.1". Metal body enhance great stability and durability. With non-slip rubber to enlarge friction and reduce damage. Clamp Mount Maximum Opening: 5.4cm / 2.1"
Package Size: 18.3 * 11.1 * 5cm / 7.2 * 4.4 * 2"
Manual measurement, there might be 1-2cm errors.